Standard Manufacturing adds to its SKO models, releasing the shortest version of its SKO semi-auto shotgun aptly named the SKO Mini. Made in the US, the SKO Mini measures an overall length of 27-inches with a 14 2/4-inch threaded barrel chambered for 2 3/4-inch and 3-inch shells. The 12-gauge shotgun is machined from 7075 aluminum and is mil-spec hard anodized for durability. Standard Manufacturing says all internal components are sale bath nitride coated to provide lubricity. Offering a lightweight feel, the SKO Mini weighs in a just over 7-pounds. 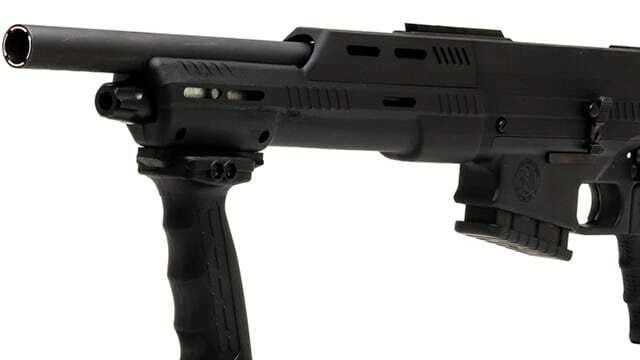 The gas-operated mini shotgun features an ambidextrous safety, AR-style controls and a threaded muzzle for choke tubes, door breachers or other accessories. The SKO Mini ships with a 2-round magazine, though optional 2, 5 and 10-round mags are available for purchase. Interestingly, the SKO Mini is not classified as a short barreled shotgun by the ATF circumventing the need for a NFA tax stamp. The SKO Mini is shipping now from Standard manufacturing with a MSRP of $699.